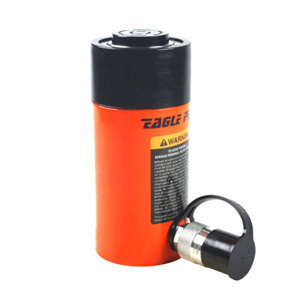 Eagle Pro ES series hydraulic cylinders are designed for use in the toughest environments. Heavy duty wiper rings keep dirt and debris out of the cylinder. A composite bearing ring provides additional support to reduce wear from off center loads. Each comes standard with a high strength, straight pull return spring and a heavy duty dust cover to protect the high flow coupler. All ES cylinders comply with ANSI/ASME B30.1 standards and feature a lifetime warranty against manufacturer defects.